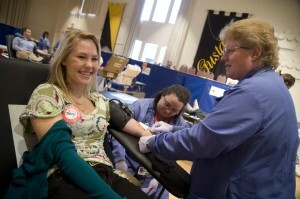 Jenny Broman '10 giving blood at a Gustavus blood drive. Members of the Gustavus Adolphus College and St. Peter communities alike will have the opportunity to give blood on Nov. 2 and 3 in Alumni Hall on the Gustavus campus from 12-6 p.m. Anyone may sign-up outside the Market Place on Oct. 26-28 and Oct. 31-Nov. 1, or they may signup online. Walk-ins are welcome, but appointments are strongly preferred. Held each fall and spring, this American Red Cross blood drive gives hundreds of Gustavus community members the opportunity to help save a life by giving up just few minutes of their day. The blood drive at Gustavus has been very successful in recent years, thanks to the community’s generosity. “We’ve been the best school in the Minnesota Intercollegiate Athletic Conference (MIAC) in the past couple of years, in terms of the number of people giving blood. It’s the kind of people who go here that give blood,” senior Steven Manley said. Junior Erik Velgersdyk has donated blood at Gustavus and is happy to be able to help others. “It’s quick, and it’s really easy,” he said. The need for blood is great and constant. Someone in the United States needs blood every two seconds. That amounts to a need for more than 38,000 blood donations each day, which help save the lives of 5 million people each year who are involved in accidents, undergoing chemotherapy, and more. “No one really thinks about it, but when anyone gets hurt it’s one the first things that people need. It’s not complicated, but it’s something that they need as much as any procedure,” Manley said. When disaster strikes around the country, blood is of urgent need. “Giving blood is one of the easiest things you can do to help. It takes just a half hour of your time, and it makes the biggest difference,” junior Kate Redden said. The blood drive at Gustavus is organized every fall and spring semester by communication studies students, and is sponsored by the Communication Studies Club. If you have questions about your eligibility to donate blood, such as if you have been abroad recently, call the American Red Cross at (800) 733-3767. If you have other questions about the drive, contact Manley at smanley@gustavus.edu.